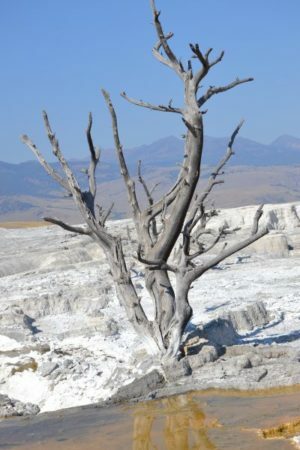 What a beautiful time to visit Yellowstone– mid-September, about 2 weeks before closing for the primary tourist season. The weather was really good, with temps in the mid 70’s. On the last 2 days it rained and was just starting to get cold, especially at night. I had no idea that there was so much to see inside the park, and 4 days was perfect. Besides the famous Old Faithful geyser there are waterfalls, canyons, hiking trails, hot springs, wildlife, and a large lake. 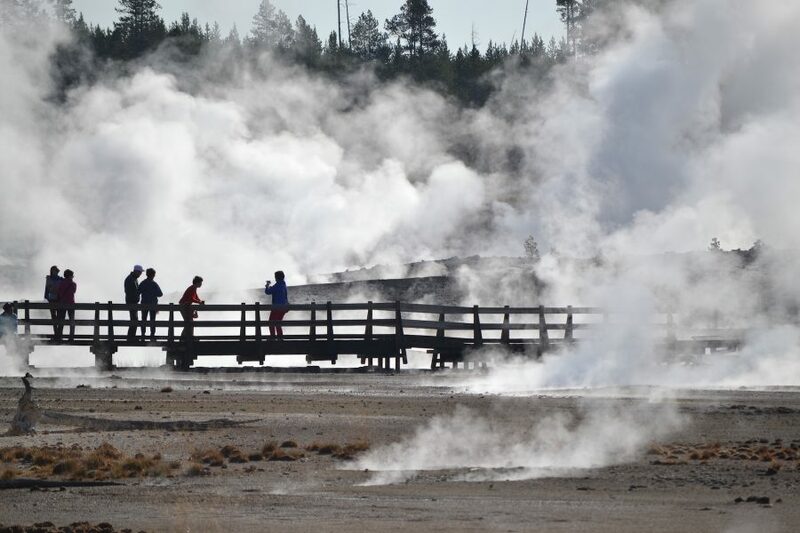 My favorite area was Norris geyser basin with walking trails on boardwalks. Although we had booked this trip last-minute, we were able to get rooms inside the park lodges, but we had to move around to different hotels 3 times: Canyon Lodge for 2-nights, Old Faithful Inn 1-night, and 1-night in the Old Faithful Lodge cabins. The park is very user-friendly. There are hundreds of miles to explore. As long as there are no orange cones up blocking the road you are free to roam. There are plenty of picnic areas and pull-offs to stop at and take pictures. This park is very accessible. I was surprised at how many people I saw with wheelchairs and walkers. The park provides ramps, accessible rooms, and special parking. The food was not very good. You have to eat in the park restaurants, or buy food in the little convenience store. The buffets were priced fair and the nicer sit-down restaurants were a little pricey for the quality. If I were to do it again, I’d bring more food in. It gets really dark at night. You need a flashlight, and there are not many streetlights. This is great for star-gazing. No televisions, no wifi, and no radio. Welcome to off-the-grid!